I hope you have enjoyed a good summer break with lots of fine weather, writes club chairman, ROY WELHAM. We all need a break, not least of all skaters. Although you might not like to be off the ice for long, I can assure you it is for the best and enables you to come back refreshed and raring to go. Did you read my letter, and the article on page 5, in Ice Link issue 49 about SKATERS' MUSIC at competitions. I am now waiting for NISA to make a ruling. In the meantime it is up to all club members to set a good example by looking after their music, whatever format it is recorded on, because poor or damaged recordings make it very difficult for skaters to perform at their best. 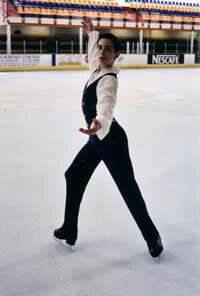 Skaters should have a practice recording with a good length lead-in, and a competition recording with a short lead-in. The box and recording should be marked clearly with the skater's name and club and, where applicable, the type of programme (short, long etc). Our next important event is the GALA on September 17. Admission is free and we hope every club member will attend and bring along not only their families but their school friends (why not the whole class? ), colleagues, friends and neighbours. We really have got a terrific programme lined up this year. The committee is still reeling from the shock news that CLUB ICE and after school PATCH TIMES are being altered to allow the hockey teams to change their training times. The first I knew of this was at the end of July when most of the committee was on holiday. Although it was not really open to discussion, vice-chair Sacha Hartley and I talked it over and went back to the rink management with a proposal that was turned down. We called an urgent meeting of available committee members and agreed that as the changes were due to be implemented on August Bank Holiday, we would have to adopt the new arrangements (as shown on the noticeboard) for the time being and discuss it at the next full committee meeting. I do appreciate we now have difficulty in providing Skating For All. If you have any ideas that might ease the situation, please let me know as soon possible by putting it in writing and leaving it in an envelope at reception for the club folder where it will be treated strictly confidentially. There will be no auditions for skaters wanting to skate in the choruses or group numbers at this year's pantomime which is to be based loosely on the Arthurian legends. Instead skaters must submit an application form by September 14. Forms are obtainable from reception and the club table. Selection of skaters for the principal parts has already taken place. Copies of BISC News with colour photographs are now available,priced £1. Members can still get black and white copies free as part of their membership. BISC fun night, 6.15-8pm. See noticeboard for details. 6-7: NISA youth development camp (dance), Sheffield. 11: BISC committee mtng, 7pm. Sale of secondhand skates, clothes, etc, rinkside, 5-7pm.